Today I really wanted a cookie. First, I made vanilla kale chips, and they turned out ok—the original version was way better (I subbed in hemp seeds for cashews and erythritol for maple syrup…this made them just ok instead of amazing like the original recipe. Once I’m eating nuts again, I’ll re-post about the amazing ones). The kale chips surely didn’t fill my cookie craving. Form into cookies and place on cookie sheet. Note: with coconut flour, your cookies will not spread or flatten, so if you make them into balls you need to flatten them into the shape in which you want them to end up! Bake for 15 minutes at 350 degrees. I made 20 cookies, but it will all depend on what size you make them! I’ve always loved cookies with a little texture–the dough for these cookies was really a great texture too, which doesn’t always happen with coconut flour! I took some cookies over to my Mom’s house, and the verdict was great—the catch is, we all decided that these are more like a breakfast food than a dessert. As most coconut flour based cookies, these are about 5-10% muffin texture (so not like an ooey gooey chocolate chip cookie in the middle!). 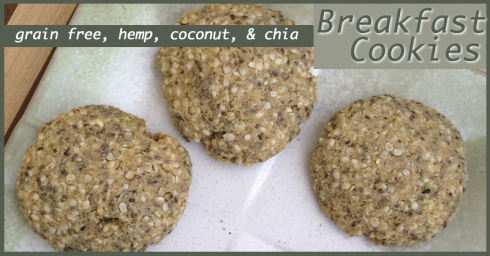 These particular cookies have a nice nutty background flavor from the hemp seeds, and talk about a powerhouse set of ingredients–hemp, coconut, and chia! I anticipate them being very energizing and satisfying in the morning (and I may toast one and put sunflower seed butter on it just to test out that theory!). We decided these cookies would be awesome with a smear of cream cheese, alongside some eggs for breakfast! Honestly, I think you could make them in a mini muffin or donut pan, and they’d turn out fabulously that way too. For me, I ate three, and it filled my cookie craving. Happy. Those look so good. I’ve yet to try hemp seeds if you can believe that. My goal for the week is apparently to find a new gym! This weekend I was lucky to go to a yoga class. So…wait, you have a sauna in your house or what?? Sweet. Goals for the week – bake my baby boy a 1st birthday cake using an old Annemarie Colbin recipe that’s only sweetened with fruit! Icing made with bananas! Wish me luck. You’ve gotta try them, they’re awesome! If it turns out well, can you describe the icing? I’m afraid it would turn brown, but clearly I am no expert on banana icing! Awesome! I was organizing my freezer yesterday and found a big bag of coconut flour waiting to be used. Erythritol sort of scares me… do you think my fear is unfounded? Good luck with the cake! I can’t wait to hear how it turns out. I’m a big fan of Annmarie Colbin (mostly her whole foods approach to bone health, but I love her in general!). Yes, I have an infrared sauna in my house—it’s a 3-person one, but I got that so I would have plenty of space to lie down while I’m in there. It’s great! I have read as much as I can find on erythritol, and from that, it seems ok to use. I’m still not 100% sold (I mean, look at all the things that experts say are fine that turn out to not be!). So I try to use it sparingly and in moderation (maybe once a week in a recipe). That said, it appears safe (I don’t like that it’s made from corn though. Alternately, Xylitol is traditionally made from birch bark and that seems ok too, except too much of it causes GI problems and it’s not totally glycemic load free)…I think it’s healthy to be skeptical! seriously, it is such a good feeling to start the week with a clean house!! i did around-the-home tasks yesterday, too, and now feel set for the week. nice work on the cookies, lisa!! i wonder if you could add in choco chips?! i like your suggestion of spreading on cream cheese for a “breakfast cookie.” and it’s always good when other people enjoy your creations, too! so glad you had such a nice weekend, and i’ll look forward to your updates this week. i esp give the thumbs up to the yoga + sauna plan!! I think my attempt at that would be to start with one egg, replace the coconut flour with protein powder….mix, and then if it needs more moisture, add another egg. I’m not sure how it would turn outprobably a little more dense and less cake-y (since the coconut flour is so fluffy). You could also leave in the coconut flour and take out the coconut flakes and sub in protein powder. It may be great…and may be a disaster (which is how I feel about the chances of most things I do in the kitchen!). If you take out the flour, you could add a bit of baking powder, mix and then let the dough sit for 5 minutes to get a little puff (I’m not sure if this makes a big difference, but I do it sometimes and have seen it in other baking recipes that don’t use gluten flour). Good luck with all of your goals! Nothing like house guests to encourage housecleaning! Yum! Those look awesome! And who can complain about cookies for breakfast? My goal this week is to drink more water! I haven’t been drinking enough lately! Totally w/ ya — love cookies w/ texture!! Love the ingredients!! I have had this same outcome many times. I will make a dessert type sweet, and it turns out more like a breakfast treat. It almost always still tastes good..these look yummy! I like your idea of weekly goal setting! I planned out all of my work outs this week (for the first time ever) in hopes of staying on track with my half marathon training. Breakfast cookies!! Now that’s something I can get behind They sound delicious with cream cheese, or sun butter, or toasted…thanks for sparking my cookie craving! My goals for this week also involve yoga: I want to get into the studio at least 3 times this week. It seems like a magic number for me for feeling top of my game, both emotionally and physically. I don’t have coconut flour or hemp seeds, but I have everything else. Can you suggest alternatives? I have gf all purpose flour and flax seeds? The trick with taking coconut flour out is to reduce the amount of moisture you add with other flours…so I’m not totally sure how it will turn out, but I’d start by using just one egg with your GF flour (you could add another one if the dough seems too dry). For the seeds…hmmm, I’m not sure how it will be with flax—I’d most likely grind at least half of the seeds because your body will just pass them through in their whole form so you won’t get the nutrients (and by leaving half of the seeds whole, you’d still get a good seedy texture). However…I haven’t made a lot of things that have both chia and flax, and they both “gel”…so I don’t know if it will work! I’d also add 1/2 tsp baking powder and let the dough sit for 5 minutes before you make cookies out of it. Gosh….I don’t know if that was any help at all! If you try it, let me know how it goes! My goals are to get back on track with eating clean! I had more carbs & sugar this weekend (did well for so long) and I’m excited to get back to my normal eating. I still love to indulge every once in a while, but I love feeling really good everyday because of the food choices I make! oh these look super delicious! i finally found some coconut flour. yay!!!! cant wait to try them! I didn’t have any chia in the house so I lightly ground some flax seeds and used those. Added a lot more cinnamon for my tastes, too. The cookies are in the oven now so I haven’t tasted them yet, but the dough sure was yummy! I love the idea of subbing in flax! These are great! I’ve been looking for a good healthy cookie for my toddler, and all the recipes I tried were super crumbly and made a huge mess. These have a nice muffin-like texture and don’t crumble! I’ve been experimenting with substitutions and add-ins and so far, so yummy! these look just great! would it work ok with oat flour instead of coconut flour, i’m not sure if i can get hold of the coconut flour?? I tried these yesterday, pressing them out and wound up with nice crispy cookies that weren’t sweet but have tons of texture just as claimed. Planning on two with low fat yogurt for a healthy breakfast. Thanks for sharing! This is just the recipe I have been looking for. 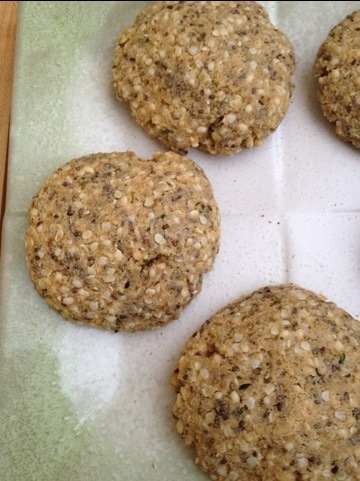 This is my first try with coconut flour, hemp and chia. the only thing I changed was that I used honey and not quite a whole half cup as I thought it would be too sweet. I mixed the coconut oil into the honey (didn’t want it to freeze as my eggs were cold). Anyway, it came out really runny. So I added another 1/4 cup of coconut flour and had a much better consistency. Not super thick but not runny like before. Has anyone else had this problem? Is it because I used honey? oops. I also left out the shredded coconut because I don’t like it. I’ve just recently bought my first hemp hearts and like the taste of them. 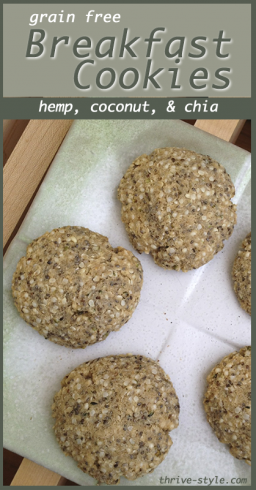 These cookies look so good I think this will be my first recipe to try with hemp. Think some nuts and raisins will be good added in, too. Can’t wait to try these! neat! could you use honey in place of the maple syrup or erythatrol? I made these cookies exactly as the recipe stated and found these to be far too dry for my liking. I could see myself liking this recipe if there was more fat to make the cookies moist or something to make them more flaky. If anyone else has suggestions for this I’m up for hearing them! That aside, “breakfast cookie” wasn’t a term that I have seen used with recipes before but after making these it clicks why they are described in this way. This recipe is really crying out for some sugar so if you make these, add double of what is suggested here. Even for a breakfast meal where you aren’t looking for something too sweet, these still come up short in the flavor department because they need the extra sweetness. I made these as well. I didn’t have coconut, but my kids aren’t fans of the stringy texture anyways. 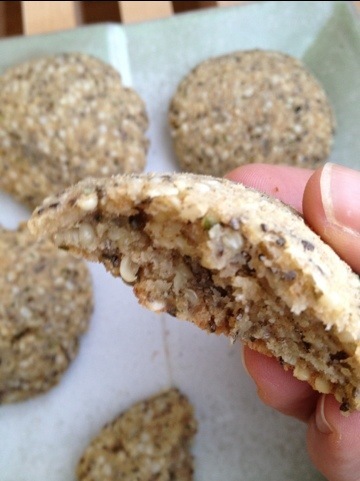 I instead used ground flax seed. I also used honey instead of maple syrup. Lastly, instead of cinnamon I used pumpkin pie spice. Really yummy! They aren’t going down in my favorites until I play with it some more. But it is a nice and healthy cookie that I don’t feel guilty about serving to my kids! I made it a bit different. I cooked coconut with condensed milk first and added condensed milk instead of maple cirop. It was very nice and just moist enough! I added diced apple and raisins to mine and they were delicious. I love that the kids think they are a treat when really they are eating something healthy. Thanks so much for sharing! Previous post: Improve Your Metabolism Through Food: It’s not rocket science, but it is science. Next post: Yoga and Breathing for Relaxation …and Your Skin!